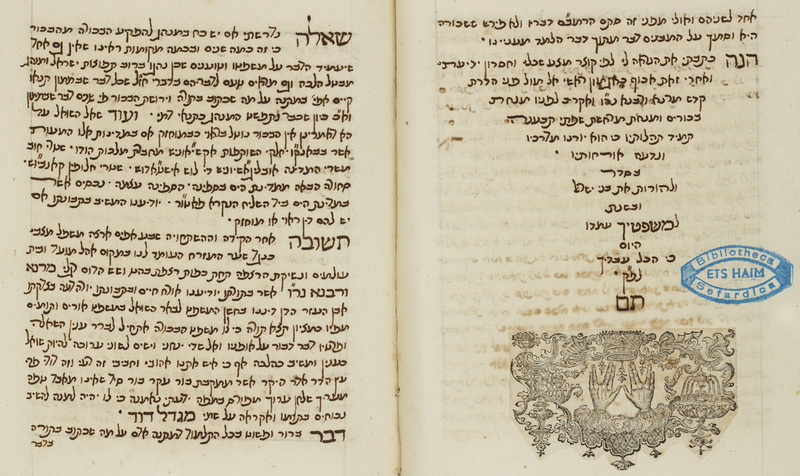 Responsa of the Sephardic academy Etz Haim in Amsterdam written by Isaac Cohen Belinfante. זה השער / ל″ה / ספר / שאלות ותשובות / כתיבת יד / באמשטרדם שנת / התקכ″ז לפ″ג. Responsa of the Sephardic academy Ets Haim in Amsterdam, written by Isaac Cohen Belinfante, 1767. The collection also contains printed responsa from the years 1691-170. Responsum of the disagreement over the halakhic authority of the Kabbalah with reference to the commandment of praying together with a congregation, by Tzvi bar Jacob Ashkenazi, Altona. Hebrew / Paper / 19,6 x 15,3 cm. /  ff. / Sephardic cursive writing with square headings / Title written in square characters in engraved frame, cut out and pasted upon the page / At the end of each responsum an engraved printer’s mark is pasted.